The fall garden is officially off the ground – meaning the seedlings I planted in July are in the main garden. I planted six tomato plants (out of 10), four green pepper plants (out of 10), three zucchini mounds, 2 seeds per mound, and four cucumber mounds, 2 varieties, 2 seeds per mound. The tomatoes are a paste variety and a traditional “round” variety; the peppers are a “bell” variety. The only question mark is one variety of cucumber – everything else has a good history in this garden. I had planned to hold off until Labor Day but it looks like we’re going to experience a few days of overcast, “cooler” , wetter weather so I jumped the gun but held back most of the seedlings until I’m certain the weather will be favorable. I also cut palmetto fronds to act as sun screens until the new plants are established. The young plants just can’t handle the intense afternoon sun. It looks like my compost pile is going to be depleted with the last seedling planting next week which is just perfect. That means all of the seeds and all the plants are planted in 100% compost, about a foot deep. Simon told me that a common “amateur” mistake is to put a $5 plant in a $0.5 hole. He’s got a piece of paper that says he’s a master gardener (from Alabama) so it must be right. I normally plant some with full compost and some not. This will be the first 100% treatment. The next pile of compost, now cooking, will be for the winter greens. Picked the last of this season’s pineapples. Didn’t keep an accurate count but think we ended up with 8 or so. I think there’s 25 -30 plants, some with several side shoots so if they can survive the winter, we should have a substantial crop next summer. I have enough frozen chunks to make pineapple flavored smoothies all winter. Now all I need is for the greens to start coming in. Haven’t planted any yet – just too hot – but I’ll try getting some collard seedlings going this week. They handle hot weather better than any other green I grow. One of my neighbors, Harvey, is moving and had a yard sale. I was surprised to see a mother lode of fishing tackle including fairly nice rods and reels. I’m now the proud owner of 5 new rigs, 3 bait caster reels and rods and 2 spinning outfits, rods and reels. I got it all for $60 which is what I would have expected to pay for one of the reels. I’ve been ok in the reel department but my rods are getting a little long in the tooth so my future was going to include some new rods before long. Also, Simon’s trailer was broken into a few weeks back and all of his fishing gear was stolen so I sent him a care package with half a dozen reels I’d picked up over the years and kept as backups. So my backup stores was fully depleted. I went out to mow and cranked up the craftsman on the first pull as usual only to find that the self propelled feature was gone – the drive wheels were locked up. I turned it over and found the axel was tightly wound with vines from previous mowings and figured it would be ok after cleaning them out. Wrong. It must have broken a belt or stripped a gear so it’s in the shop. It was really hot so I’m not terribly distressed about this turn of events and hopes they don’t fix it too quickly. The weeds are the right color so ………….. This visually impaired county service may be a bit of a problem. It’s a Social Services kind of operation whereas Nancy is more of a precise, German kind of citizen. If she asks a question, an answer that begins with “well, that depends” is not going to work for her. She is big on specific start- stop schedules and specific agendas and I can tell from the first interfaces, the styles are going to clash. We had a visit this week from the “white cane” lady and picked up a few tips on using that specifically to let others know that she’s impaired as opposed to using it as a touch instrument. She also got a good pair of sunglasses designed specifically to cut down on side glare and other glare. I tried the glasses myself and they really do cut down on glare – in fact I think I’ll get a pair for myself. We also learned that at the center itself there is a “magnification” lab where she can look at various products and determine which do the best job. She told us that the way we’re walking now is just fine – at least we’re not doing anything wrong. I really didn’t think so. Lot to learn! I decided to start transplanting tomatoes and peppers into the garden, a week or so earlier than I’d been planning. The plants are getting “leggy” and will surely break off if not replanted deeper. It’s still too hot for my liking but it looks like rain in the forecast so hopefully I’ll be able to “steal” a few days. One problem I’m trying to solve with this planting is having good support for the plants as they grow. I bought 8’ iron fence posts a few weeks back and have them planted 18” deep, 3’ apart to tie the plants as they grow taller. I might install wire cages around some of them for added support. I’ve learned that the cages themselves just don’t do the job on a full plant in a strong wind so I’m hoping this will get the job done. On the food front – a few months back we read a review on a little breakfast/lunch in Ormond and vowed to give it a try when convenient. Interestingly it’s located in a small shopping center that we frequent from time to time and we had never seen this place. We have several doctors in that area so if we have an early appointment, we could try breakfast. That happened today with a visit to Nancy’s dermatologist. The reason we had never seen it was that it is really a tiny front and the small sign indicates it to be a coffee shop. When we went in, clearly it was doing a bang up business and the patrons were more or less the AARP crowd. Also all the patrons and employees were on a first name basis. The breakfast specials hooked me with a scrapple and eggs plate and really set the hook when the waitress asked if I wanted it crispy and also if I wanted the biscuit warmed or grilled. Just the right questions. The food was as good as it gets and the biscuit was a prize winner. In the same league as the flying biscuit in Gainesville or Jim’s in San Antonio. Way too much food so next time I’ll ask them to hold the biscuit until we’re leaving and then take it home. Not done on food. Nancy had seen an interesting recipe on TV for shrimp scampi. I pulled it up on the computer and determined that we had everything on hand (or in the garden). Incredible. The surprise ingredient (to us) was anchovy. So this was an over the top food day. The tourney was a success with Nancy scoring good master points and me keeping up my surf fishing dry spell. I did manage to spend plenty of quality time on the sand and on the piers sipping suds. The place was ok but we found a new possibility in the Hammock area – Palm Coast’s Beach. It’s been there since 1930 but it’s nestled in the oak trees so I never noticed it from the road before. It’s unique in that it’s constructed of solid coquina rock, inside and out so you have a totally different feel than in a conventional hotel room. It’s a few hundred yards from the beach, maybe half a mile, but the property stretches back to the intracoastal. I didn’t check that out but next time we’re there for a couple of days, we’ll be sure to book this place. It’s also about half a mile from Bings Landing where the Captain’s barbecue operates, half mile from Washington Oaks State park where I often fish, and maybe a quarter mile from JT’s fish shack, a favored dining spot and happy hour watering hole. We also noticed, for the first time, that it’s a few hundred yards from a cheese and wine place that seemed to be hustling and bustling last night when we drove by. If you avoid the peak times, aka bike week, race week, Xmas etc, the rates are about $65 per night and under $400 for a week. My take on it is that if you like Marriott’s and Hampton’s, this may not be your kind of place. The name of the place is Palm Coast Villas if you want to check it out. An instructor for the visually impaired place comes by next week for Nancy’s first lesson. She’ll be bringing the “white cane” and I guess teach Nancy proper beating and swatting moves and fencing positions. I probably need to pick up suitable body armor, a shield and a helmut. Getting ready to plant the fall crop. I have a dozen tomato plants of various types and varieties and a dozen green pepper plants. I started these in July and they’re looking good. At the same time I’ll plant a few cucumber seeds and squash seeds directly in the garden. Then I get started on planting seeds for the winter crop in jiffy pots on the porch. It’s still way too hot to plant them directly in the garden. The first wave of winter crops will be cabbage, cauliflower, broccoli, kale, chard, and collards plus a few parsley plants. The kale, chard, Parsley, and collards will produce new leaves as picked so they will last all season; the cabbage, cauliflower, and broccoli will be replanted once a month to provide a continuing supply throughout the whole season; ditto lettuce. I’ll direct plant the root crops, radishes, carrots and beets, along with spinach about the first of November – enough to get thru the first of the year and then squeeze in a second planting, space permitting. Maybe, if time and space permits, I’ll try celery again but that’s on the back burner right now. I spent the eclipse knee deep in the surf at Flagler Beach. My theory was that the fish would go into a feeding frenzy when the sun disappeared. Didn’t happen. In fact, heavy storm clouds made the whole thing a non event. Other than the advertising, I’d never guess something actually happened. We had a nice weekend with Tom and Tina – on Saturday they took Nancy to a theater in Daytona and then came back here for a pasta feast; on Sunday we drove down to Lake Mary they took us out to a barbecue feast at a new place in Disney, the Polite Pig. Great food, great drinks. They definitely know what they’re doing when it comes to restaurants. We’re taking a mini vacation this week. Nancy has a 3 day bridge tournament at the beach starting Thursday. It’s about a 45 minute drive but we decided rather than driving back and forth 3 days running, we’d get a hotel for a couple of days and hang at the beach. That works for me. Thursday night is fish and chips night at the Golden Lion and I see a giant burger in my future at the Sea Turtle Cafe. I get in two good days of surf fishing – with school back in session the beach will be deserted Thursday and Friday. Not sure what I’ll do on Saturday when the masses return but have no doubt I’ll do just fine. There’s nothing at all going on with the garden so the break will fit in. We continue to get serious summer rains. Seems like it’s averaging an inch a day over the past couple of weeks and the lake is approaching “full”. I define full as the top step of the ladder being submerged. I’m ready for it to slow down just in case we get a hurricane like event that overtops the dock. When I said nothing going on in the garden, that doesn’t include the pineapple patch. I picked two this week, one for us, one for George and there is another one about 2 weeks away. That’ll be it for this year. I think we picked 6 or 7 this summer. Assuming all the cut tops and offshoots I planted produce next year, we should have a couple dozen pineapples to deal with. 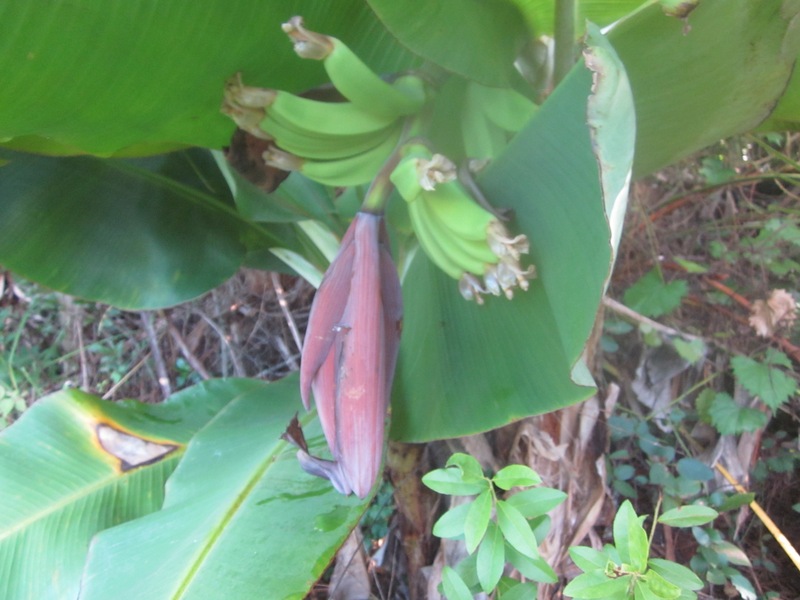 Hang on to your hat for this news – our banana plant may be “with child”. We planted a finger banana bush right after we moved here and had bananas the first couple of years but then we had a string of winters with hard freezes which, seemingly, killed them. Last winter was warmer than normal and the bush came back nicely but still, no fruit. Then today I was clearing jungle in the vicinity and noticed a longish, purple appendage coming out of the bush which I have to assume is the start of a pod of bananas. Under normal conditions we have maybe 5 months until a frost so if this pod is the start of a fruit crop, it may actually have a chance to develop. Fingerlings are tastier than the grocery store fare and maybe half the size. A single pod could potentially produce a dozen or so bananas. The bananas you see in the photo came from one pod and that’s a new one developing under the original one. Those bananas you see were hidden in the pod up until a week ago so they seem to mature rapidly. No idea when they’ll be ready for harvest but I suspect it will be within the next week or so. There are actually two plants there but only one is producing fruit at this time. Bananas, watermelon, pineapples – my veggie garden is turning into a fruit orchard. At this point I have 26 pineapple plants of various ages and states of development and a waiting list of potential “customers” for fruit. I spent about 4 hours over the last two days working in the pineapple row, cleaning out weeds, fertilizing, laying down a layer of paper mulch and then over covering that with grass clippings. I started this as a test and just something to fill an empty row but now I’m getting serious about it. The next one we pick is designated for a pineapple upside down cake. Nancy came into the living room at 7PM on Saturday and announced that the water had stopped. Never during the week, never in broad daylight. The last time this happened I removed the cover of the contactor and found a cooked lizard across the main contacts. This time it was a large palmetto bug, AKA, big ole roach. It’s a 220V environment so you have to be careful dealing with it but I’m getting adept at opening the contacts and cleaning them with an emory board or small piece of fine sandpaper. Sure enough, it leaped back into service so a potential disaster averted. And one less roach prowling the jungle. I’m trying a new approach to protecting the contractors from outside critters – wrapping it with a plastic grocery bag and taping it shut. It’s impossible to do anything like a hermetic seal but this should keep out the really large invaders. And I’m spraying the whole apparatus with a potent bug killer. I’m a happy camper! I found a feature on the Mac that converts text to voice!! It’s really simple to use and will complement the general ability to expand text size. Reading a page of text that has been expanded to about 40 point is tough with lots of scrolling but with this feature, you just select the page or paragraph or sentence or word, whatever, and listen. There are setup options to pick among voice types and reading speed. The default voice is a guy named “Alex”, medium speed. He has a touch of robotic in his pronunciation. I’ll wait for Nancy to make those tough personality decisions. I’m impressed that it doesn’t just read the words but recognizes the punctuations and adjusts the speaking accordingly. Nice job Apple. Major accomplishment. We’re having company in the next few days, Simon and Amy, so the dock is likely to be a hub of activity. There just hasn’t been much going on down there in the way of parties since last summer so I wanted to do a little touch up. I have a portable boom box for the XM radio that we just left down in a cabinet on the dock but it hasn’t been played in about that long so I thought it should be checked. I started to pull it out of the cabinet and noticed all kinds of strange dust/dirt around it and within a few seconds large, large, large ants started pouring out of it – out of the boom box. I’m talking a river of ants like you see on documentaries of the Amazon Jungle army ants. I grabbed it out and knocked off the back of the unit where the batteries are stored. That area was super loaded with large, white ant eggs and a zillion more ants. Holy crap. I ran up to the house and got my super bug sprayer set and attacked it. It honestly took a half hour for them to evacuate the box. Was there any chance in the world that it would play? I gave it an hour for the bug juice to work and eventually they stopped coming out. I then sprayed high pressure air and electrical contact cleaner on the electrical interfaces – the power port, the antenna port, and the main radio module port. I plugged in the power but not the radio module – no smoke. Good sign. Then I plugged in the radio module and turned on the power. This was a tough call since I knew the module worked since I use it every day in the house and would really hate to smoke it. It worked, that is it lit up and put a message on the screen that said “no signal”. The fact that it lit up and put a message on the screen was very encouraging. I was operating this all from inside the screen porch on the north side of the house so I knew the signal would be impacted. I unplugged it all and went around back where there was no signal obstruction. Reconnected everything and away it went. Still no smoke and it sounded great and was playing one of my favorite songs. So one thing we’ll have on the dock again is music. I just think I’ll carry it back and forth from the house when not in use. duh!!!!!!!! As predicted, Simon and Amy came on Sunday and we took them to Persimmon Hollow, the Deland brewery. They travel with their dog, River, and the Hollow is dog friendly so it seemed the thing to do. When we got there we quickly found there was another, large dog on the premises who barked a greeting. The dog, Rufus, was leashed to the bar stool but that proved not much of a restraint and it came crashing down. I feared the worst but it turned out just fine after the normal sniffing routine. Then we noticed that the same guy had a small goat. Simon lives in rural Alabama and works for 4-H as the county Ag extension agent so he identified it as a miniature goat. It just wandered around the brewery meeting and greeting all the customers. Of course River is goat friendly. Interesting piece of trivia heard on CBS News. A survey found that 29% of the population doesn’t know you can get over air “free” TV – 36% of millennials had no idea. I ran into a cable sales guy in Sam’s a few months back that also didn’t have a clue that you could get TV without cable or satellite. What’s an antenna??? ?